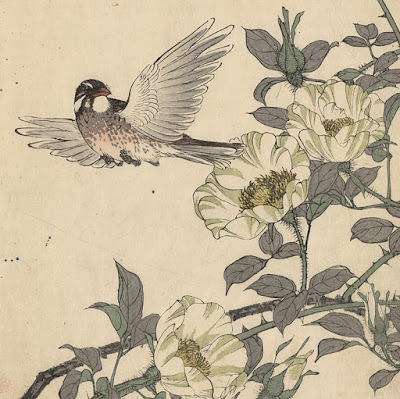 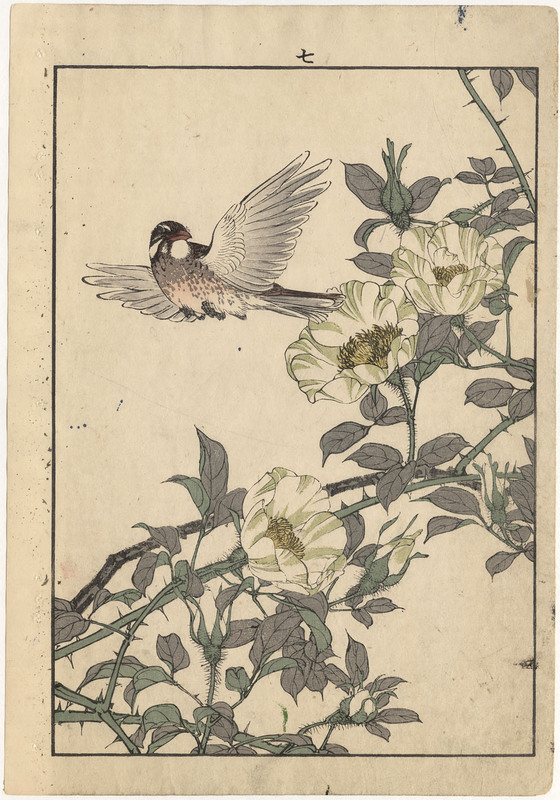 “Flying bird with flowers” (descriptive title only), 1891, cut by Tanaka Hirokichi Imprimeur: Miki Jinzaburo, from the series “Flowers and birds of four seasons”, published by Nishimura Soemon. “Cockatoo on a branch with flowers” (descriptive title only), 1891, cut by Tanaka Hirokichi Imprimeur: Miki Jinzaburo, from the series “Flowers and birds of four seasons”, published by Nishimura Soemon. Condition: both prints are in good condition but there are a few flecks of ink (created at the time of printing? ), and minor signs of handling appropriate to the age of the prints. I am selling this rare pair of original woodblock prints by Imao Keinen from 1891 for a total cost of AU$253 (currently US$191.21/EUR171.86/GBP155.37 at the time of this listing) including postage and handling to anywhere in the world. If you are interested in purchasing these large original prints, please contact me (oz_jim@printsandprinciples.com) and I will send you a PayPal invoice to make the payment easy. 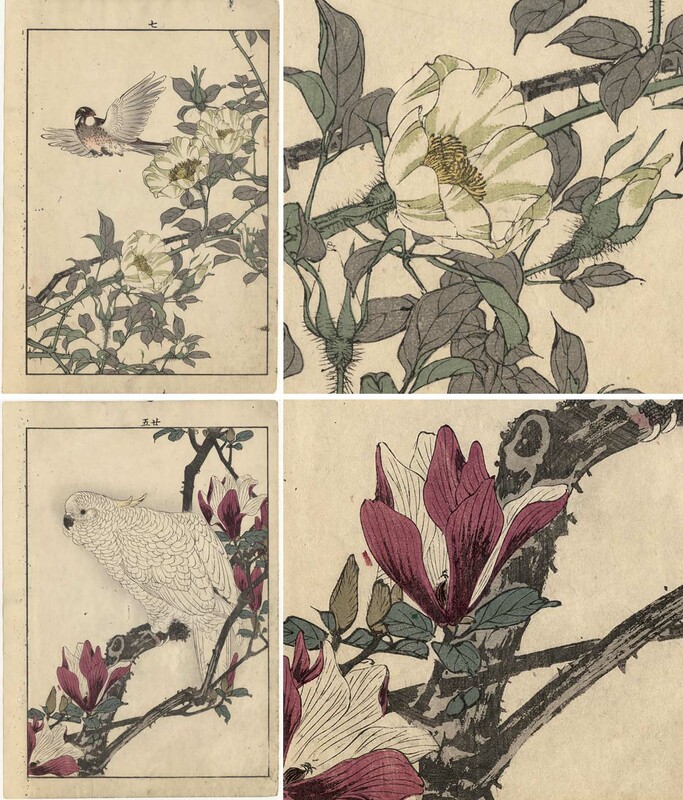 These are large and extraordinarily beautiful original prints from 1891. 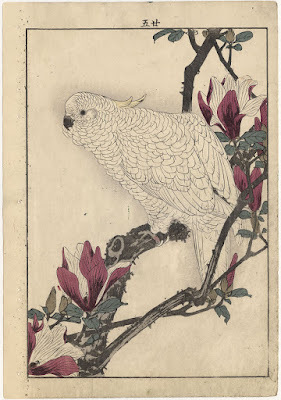 What I find amazing is how the artist (Imao Keinen) is able to suggest that white roses in the upper print are a brilliant yellow-white set against the cream colour of the paper and the colour of the cockatoo’s feathers in the lower print is a genuine snow white. 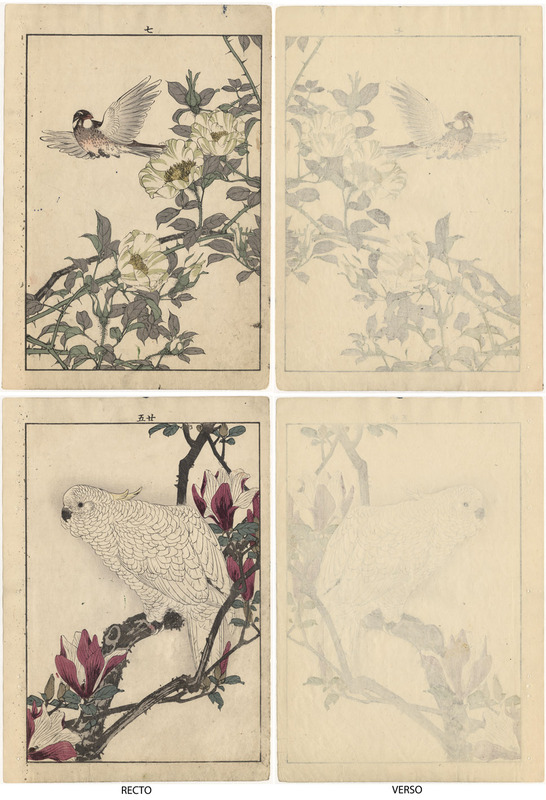 And, importantly, the artist achieved these suggestions of luminous white without actually using a single block of printed white. 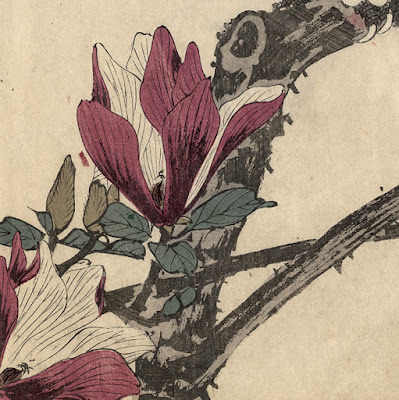 Equally interesting for me is how Imao Keinen connotes subtle differences of texture. 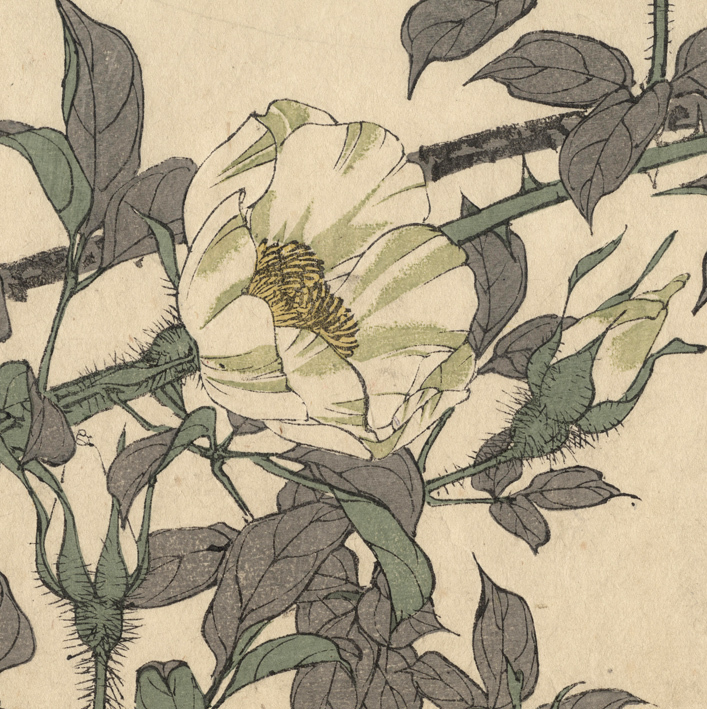 For instance, in his treatment of the roses, note how the gradation of tone within the shadows on the petals are rendered with a slight graininess suggesting the almost pillowy softness of the petals. 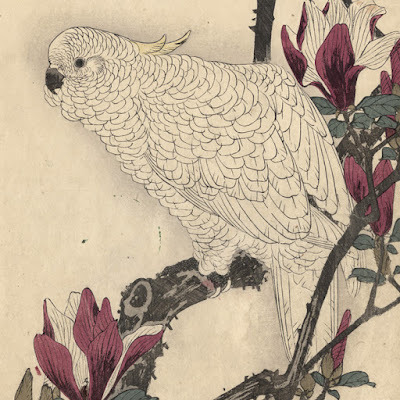 Compare this treatment with the effect of what is termed “flying whites”—an effect like dry-brushed paint—in the way that the artist has represented the shiny but rough bark on the branches in the lower print. 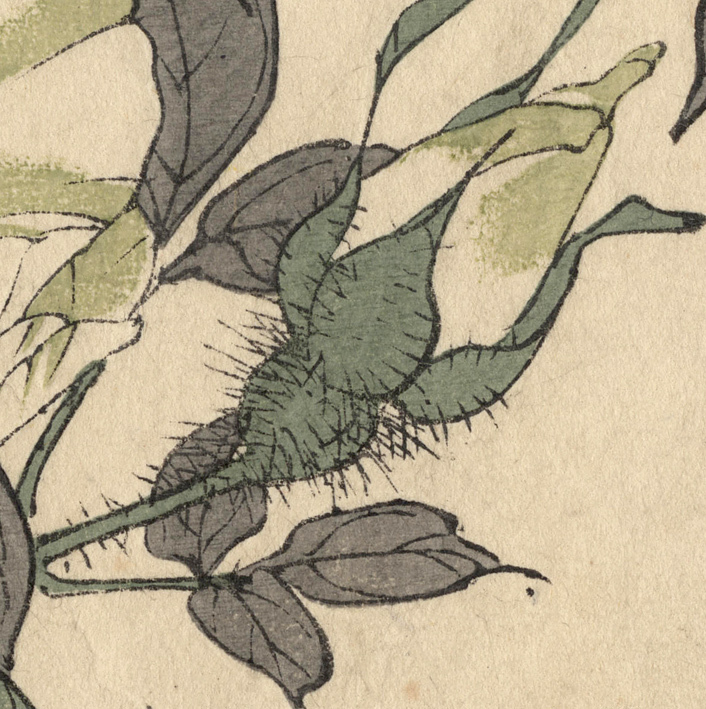 I'm guessing these are sold??? At present they are still available ... if you'd like them send me an email.